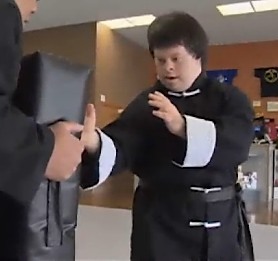 A young man with Down’s Syndrome has earned a black belt in karate, inspired by Bruce Lee movies he studied as a child. Dustin Bean of Longview, Washington worked for 13 years, quickly moving from a “special abilities” class to regular classes to earn the coveted black belt. At most, one in a hundred students perseveres enough to reach the goal of black belt.